Claude Debussy's Le Martyre de Saint Sebastien is a five-act musical mystery play that was produced in collaboration with poet and dramatist Gabriele d'Annunzio and designed as a vehicle for the great ballerina Ida Rubinstein. Because the production schedule was extremely tight, Debussy only had a few weeks to write the score. As a result, the music was penned in close collaboration with Debussy's friend Andre Caplet, whose role was two-fold; he was both the conductor and the specialized copyist, entrusted with the job of tidying Debussy's initial drafts and developing them according to the composer's instructions. Unfortunately, the work's first production was not only unsuccessful, it was attended by scandal - the Archbishop of Paris requested Catholics not attend because the dancer playing St. Sebastian was a woman and a Jew. 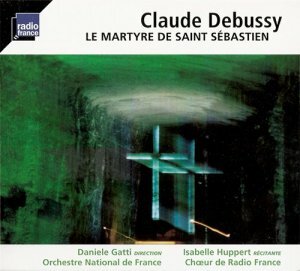 However, thanks to Debussy's exceptional score, the work has remained popular in recordings. This new recording featuring the Orchestre National de France conducted by Daniele Gatti is a rare event, as the work is rarely heard in its original version.